Bachelor contestants always look fabulous and fashionable. There is an up and coming business called Stella and Dot. It has been featured in magazines and on television. Most importantly it has been featured on the Bachelor, Bachelorette and Bachelor Pad. I am considering selling the jewelry part-time so please let me know what you all think of it. If you like the jewelry, dislike it or would want to have an online party if I join, please let me know. Which Bachelor stars have been wearing Stella and Dot? These lovely ladies love Stella and Dot. Melissa Rycroft-Strickland wore Stella and Dot on the Bachelor Pad. Ali Fedetowsky wore Stella and Dot on the red carpet. 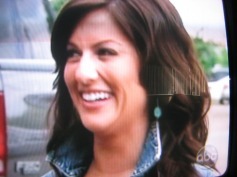 Jillian Harris wore Stella and Dot in both promo pictures. She also wore in throughout her Bachelorette season. Gia Allemand wore Stella and Dot on Bachelor Pad. Natalie Getz rocked Stella and Dot on the red carpet. Vienna Girardi is a fan of Stella and Dot. Stella and Dot is very popular among the Bachelor contestants. What do you all think? I hope you enjoyed Fashion Friday. Sorry I have not been writing, I have been busy with college. No worries I will be posting a few times a week now. Have a great weekend! Let me know what you think.